Marie Antuanelle grew up in Siberia during the political turmoil of Perestroika. During this time she sought a place of solace and comfort away from the challenging living conditions through art. 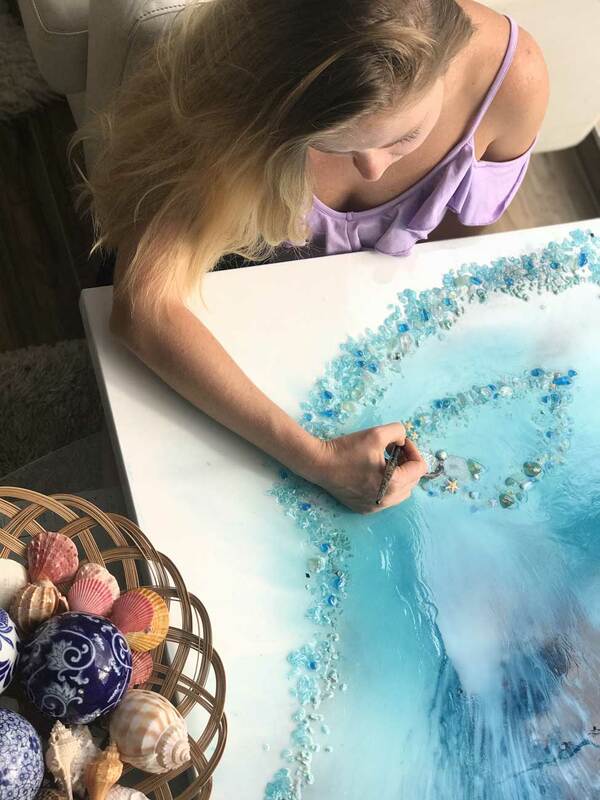 Now she has found success by creating ocean inspired art adorned with shells and crystals. 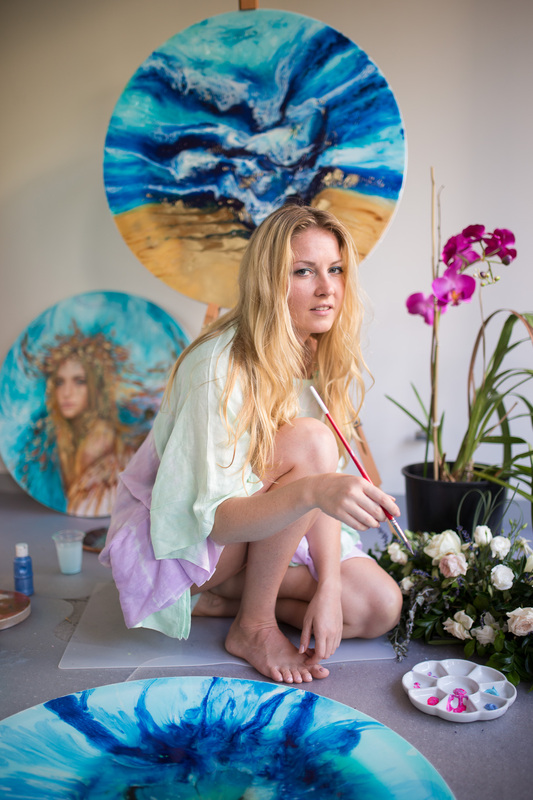 We caught up with Marie to talk about her inspirations and and see the remarkable process that goes into her stunning artwork. Tell us about yourself and how you became an artist. The atmosphere in Siberia during my childhood was a really tough time. At my parents house we had lots of books about culture and art, all influential artists with colourful reproductions of their works: Michelangelo, Da Vinci, Monet, Cezanne. Art became a therapy for me. It was something that I could do alone. It was the one thing that was for me, without having anyone want something from me. I grew up in a land of fields and forests and every summer we would spend time with my grandmother. She lived in a tiny town by the sea in the south of Russia. My grandmother was the driving force behind my creativity. She inspired me to try so many new things. Under her supervision, I learned to create textile wall hangings, macramé, knit, sew, build dolls houses out of broken furniture, climb trees, swim at the nearest beach and create animals out of sea shells. It was 3 months of freedom, creativity and the beach. The ocean inspired my art and I’ve dreamt of living by the sea ever since. My grandmother has been the most influential person in my life. She allowed me to do everything that was forbidden back in Siberia. From that time, I have associated the ocean with freedom and everything that is possible. Spending her childhood summers by the sea instilled a love of the ocean in Marie. I often use aerial drone photography as my source of inspiration for the perspective and colours – the view rising above the coastline feels like flying – ascending towards the sky, yet trying to take in the view of all the earth beneath you. I paint with music on as it gives a certain energy and the character to my movements, like the movement of my hand with a plastic cup in it pouring translucent liquid onto a horizontal surface. It is a meditation – I don’t feel time passing. 6 hours can disappear in a split second; there is never enough time. All the lines and shapes keep moving towards gravity for hours after I make my pour. Marie wears fun outfits while she pours the resin! 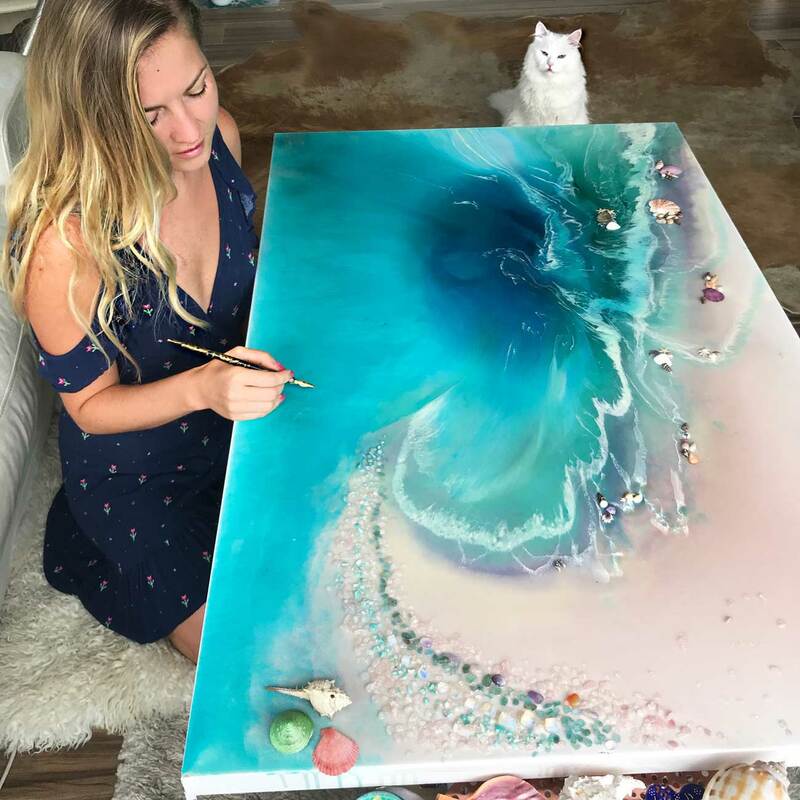 I only have 30 minutes to pour the colours and after that I can’t touch it. It still continues to move on the board and I need to monitor it to make sure it hasn’t fallen to the floor. 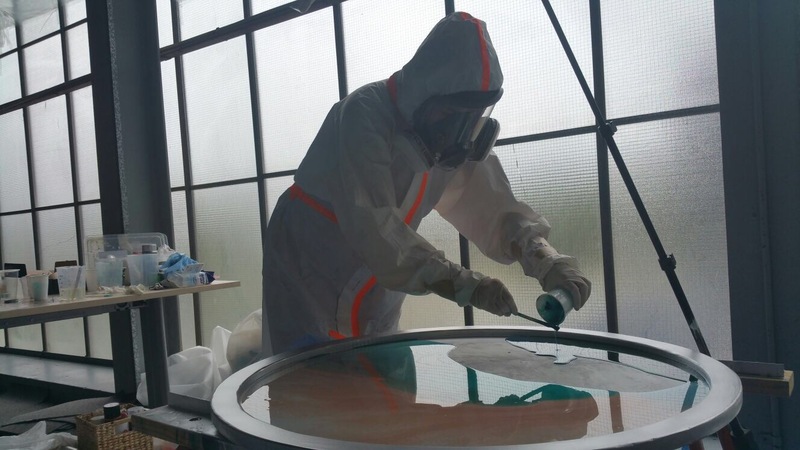 The painting continues to change during the next 3 to 8 hours, and after two days it will set and the next layer can be added. It is translucent and you can see one layer through another. This creates depth and very organic shapes. What I’m trying to do is make it less man-made and more natural. Bright colours and metallic golds feature heavily in Marie’s work. Tell us about your process and your preferred media. 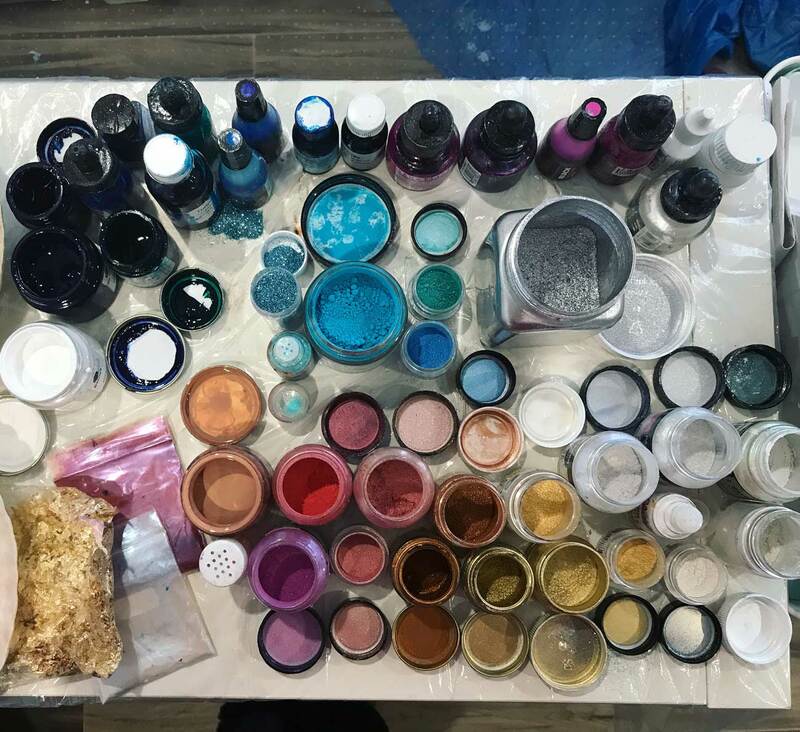 I use “Liquid Glass” Epoxy Resin, but I use other mixed media too. 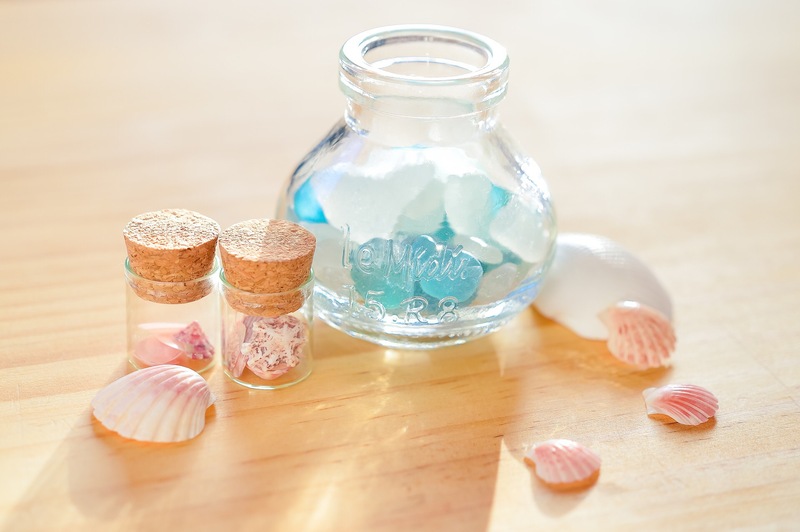 The resin looks like the translucent water that inspires me. When I travel to some popular beaches which are usually quite urbanised, I meditate there to get the feeling of the essence of the space. I’m trying to imagine how it looked centuries before humans were there. Once the idea becomes a bit clearer in my mind, I use a drone to capture the feeling of flying like a bird above the area and paint a couple of watercolour sketches. I think watercolour pigments behave similar to pigmented resin when applied “wet on wet”. Then I create tiny resin paintings just to get the shades and make sure I’m happy with the composition. When I am satisfied with the tiny prototypes, I create the big artwork. They can be up to 2 metres long. Working hard on a large piece! Why did you join Bluethumb? What has it meant for you and your career as an artist? Because having an exhibition is quite costly, and therefore possible only a few times a year, I went looking for online galleries like Bluethumb. I’m glad I found it. Bluethumb gives me constant exposure to thousands of people daily. It is important what art is displayed alongside mine, so I’m glad I can show my artworks alongside other talented Australian artists. It helps you develop as you have to think about not only creating your art but also about how to present it to customers, something I’m still learning. Marie adds shells and crystals to her pieces. Freedom. I’m my own boss. Also, how art can affect people and influence their perceptions. As an artist you have to talk to the souls of other people through their imagination, appeal to their senses and bring the best out of them. You remind them about their human side, their spirit, and pause for a second. They put aside their everyday routine and focus on what they really want to be. 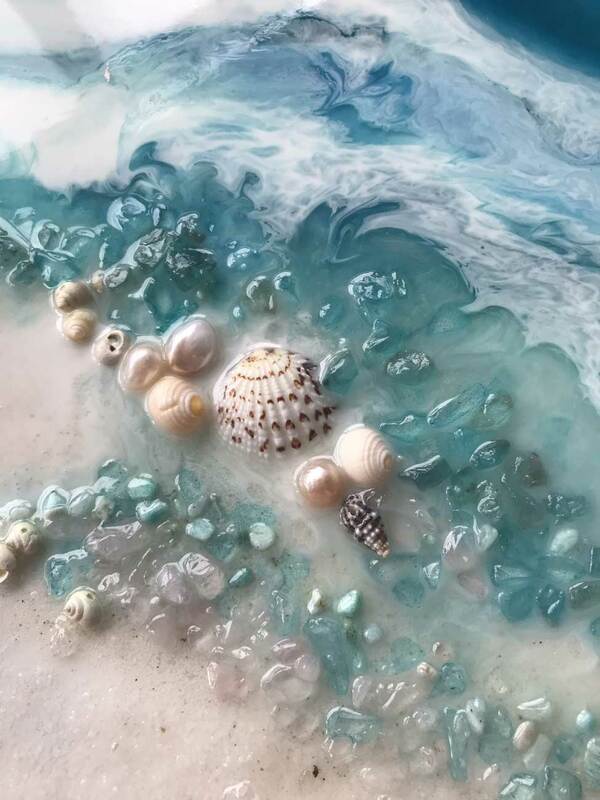 Up close, the resin, shells and crystals create a variety of textures. What are your goals or dreams for the next year? I am preparing for an exhibition at the end of the year and have an article in Where Women Create Magazine coming in the next few months. Recently, I moved closer to the beach. I hope to develop a series of works devoted to the area – the Malabar Headland National Park. 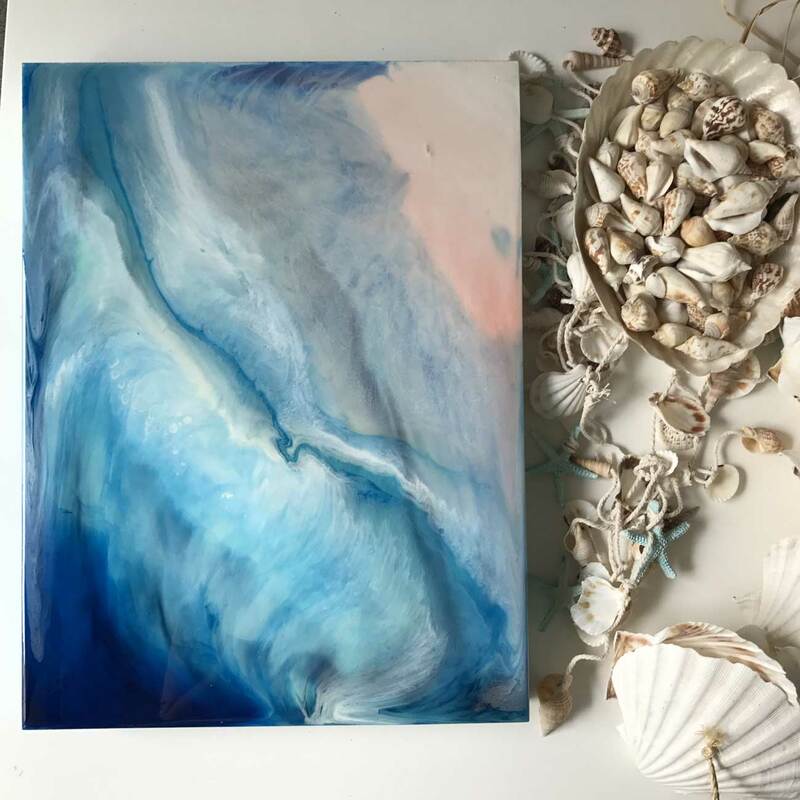 See Marie’s ocean inspired abstracts on her Bluethumb profile. Cover image by Casey Morton, all other images by Marie Antuanelle.